As NASA's New Horizons spacecraft flew by and beyond Pluto on Tuesday (July 14), it carried with it the ashes of the American astronomer who discovered the dwarf planet in 1930. Now, the mission's science team has further memorialized Clyde Tombaugh by giving Pluto's prominent heart-shaped feature his name. "A couple of weeks ago, we just started naturally saying, 'That's so prominent, we have to name it — we should call it Tombaugh,'" recalled New Horizons principal investigator Alan Stern, who's based at the Southwest Research Institute (SwRI) in Boulder, Colorado. The name is informal for now, a nickname assigned by the mission's team members to help them refer to the planet's features while working with the images and data the New Horizons probe captured during its historic flyby of Pluto. But unlike perhaps some of the other names that the team has assigned to the dwarf planet's dark surface details — names inspired by the underworld such as Cthulhu, Krun, Ala and Balrog — Tombaugh Regio is intended to become official. They plan to submit the name to the International Astronomical Union, the governing body that oversees the naming of celestial objects and their surface features, for approval as its official designation. "I can guarantee you we will submit the Tombaugh feature, and I don't think there's going to be any controversy about it," Stern told collectSPACE. New Horizons' first detailed image of the heart-shaped 'Tombaugh Regio' near Pluto's equator revealed a range of mountains rising as high as 11,000 feet above the icy body. New Horizons sent to Earth its first up-close photos of the Tombaugh Regio on Wednesday (July 15), confirming that Pluto is like no other world in the solar system. Zooming into the heart-shaped area, the spacecraft's first-released photo from its closest approach to Pluto revealed a mountain range with peaks jutting up as high as 11,000 feet (3,500 meters) above the surface of the icy body. "We know the surface is covered in a lot of nitrogen ice, methane ice and carbon dioxide ice — [but] you can't make mountains out of that stuff," John Spencer of SwRI, deputy lead of New Horizons' geology science team, said during a press briefing at the Johns Hopkins University Applied Physics Laboratory in Maryland on Wednesday. "So what we're seeing here is the bedrock — or the bed-ice — of Pluto." "Water ice is strong enough at Pluto temperatures to hold up big mountains, and that's what we think we are seeing," he said. The mountains though, are just the "tip of the iceberg" with regards to what the photos reveal about the distant dwarf planet. "The most stunning thing about this – well, there is many stunning things – but the most striking geologically is that we've not yet found a single impact crater on this image," Spencer stated. "This means this is a very young surface, because Pluto has been bombarded by other objects in the Kuiper Belt and [was] bound to have had craters happen." "Just eyeballing it, we think it has to be probably less than 100 million years old, which is just a small fraction of the 4.5-billion-year age of the solar system. It might be active right now," he said. Scientists had theorized prior to the New Horizons mission that Pluto was similar in nature to Triton, the largest moon around Neptune. Triton also does not have many impact craters due to ongoing geological activity. But that activity was attributed to forces being imparted by Neptune. "But that can't happen on Pluto," stated Spencer. "There's no giant body that can be deforming Pluto on an ongoing regular basis to heat the interior. Charon [Pluto's largest moon] is just too small to do that. So this is telling us you don't need tidal heating to power ongoing recent geological activity on icy worlds." "That's a really important discovery that we just made," he said. 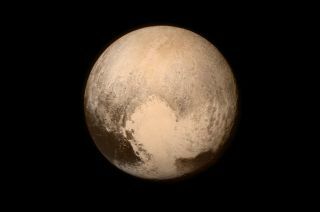 Continue reading about New Horizons and Tombaugh Regio at collectSPACE.com.